1600.00 EUR max. 4 Pers. Fly over Freiburg in radius of 60 minutes and experience the local attractions. The route is dependent on the weather and of course aviation safety, otherwise the pilot attempts to fulfill your wishes in compliance with the flight time. Exclusive flight - route and dates of your choice. Route example: Feldberg, Schluchsee, Titisee, Kandel, Kaiserstuhl, Breisach and Tuniberg. The flight time is 60 minutes. 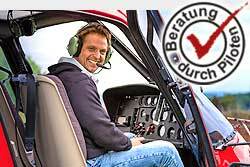 Exclusive flights depart from Bremgarten airport, on request also from Freiburg possible. Die Bell 206 Jet Ranger ist eine der bekanntesten Helikopter/Hubschrauber, die bei Rundflügen, Rundflugtagen und Taxi-Flügen eingesetzt wird.